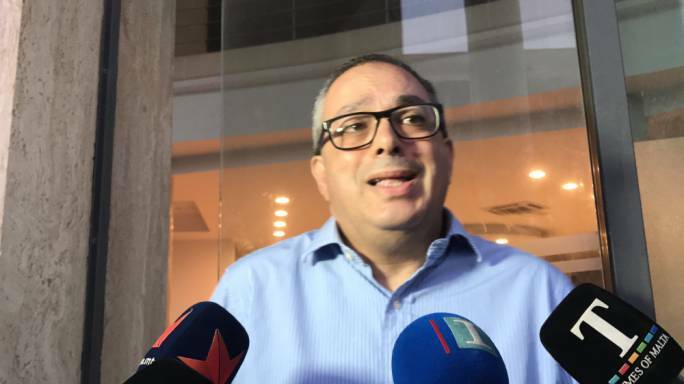 An anonymous email from a “disappointed Nationalist” has been forwarded to the Nationalist Party’s ethics committee probing the Adrian Delia allegations. The email concerns another leadership candidate, Alex Perici Calascione, and is unsigned. Labour media ONE.com.mt earlier today claimed that the party had received a letter from councilor Frank Pickard with allegations made against Perici Calascione. The PN denied receiving such statement and this morning also said that it had tried to contact Pickard, but to no avail. The party confirmed receiving the same anonymous letter sent to all media houses. “The letter has been sent to the ethics committee,” the PN said. Without mentioning any specific wrongdoing by Perici Calascioner, the letter, addressed to Aquilina and Joe Borg, head of the PN’s electoral commission, asks the party to investigate Perici Calascione on two fronts: an alleged conflict of interest he would face as leader as a result of interests in Corinthia Group and the other as a shareholder of Future Investments Ltd. According to the letter, Perici Calascione is married into the Pisani family, shareholders of the Corinthia Group along with LAFICO, a joint Libyan-Maltese investment company. The author pointed out that it was a fact that the company belongs to the Gaddafi family. Perici Calascione's wife owns shares in that company that owns the Corinthia Group. As opposition leader, the letter continues, Perici Calascione would have a conflict of interest over permits requested by Corinthia for development. The letter also states that Perici Calascione is the beneficial owner of Future Investments Ltd, which owns Fenici Insurance Agency, who in turn owns a 71% stake in Fenici Insurance Brokers. Allegedly, one of the latter’s partners is on the run for alleged misappropriation of funds. The company, the letter goes on, last presented its accounts in 2012 when it had accumulated debts of some €200,000. “Nobody is going to dictate the party’s agenda – not any party, not any newspaper, not any journalist. I am asking councillors to reflect on this kind of half-baked strategy. It is not affecting me in the least, but doubled my determination to persist in my campaign,” Perici Calascione said. The candidate said it was evident that the letter was intended at scuttling his campaign at a late point in the election. Perici Calascione told journalists he was not blaming the Adrian Delia camp, which is fighting off allegations that the lawyer was aware that his client account at Barclays International in Jersey was used to receive money from rents from London properties used for prostitution. “I have proposed in my campaign that the party has a code of ethics that would bar someone with a conflict of interest not to be present in a decision-making role in situations where that conflict comes into play,” Perici Calascione said about his wife’s family connection to the Pisani family, owners of the international Corinthia hotels brand. Perici Calascione also argued that his involvement with Future Investments Ltd ended February 2016, rendering it a redundant allegation. “If [Corinthia Group discussions] came up, I would exit that conversation immediately,” said Perici Calascione to MaltaToday after being asked what he would do if the Group had to submit applications under his leadership. The PN leadership contender cited his refusal to attend the recent administrative council meetings as proof of his commitment to distance himself from conflict of interest.